Rio LaVigne ’15 signed up to meet several White House officials after the morning session of today’s cybersecurity summit. She did not, however, expect to meet President Barack Obama. Earlier this week, a group of 10 students with interests in cybersecurity was chosen by various Stanford professors and academics to potentially attend a roundtable meeting with “senior White House officials.” It was not until yesterday afternoon that the meeting was confirmed. And it was not until after Obama’s speech, in a back room of Memorial Auditorium, that the students figured out that they might be meeting the president. The first people to enter the room were Senior Advisor Valerie Jarrett, Homeland Security Advisor Lisa Monaco and National Security Advisor Susan Rice. The three officials started a conversation with the students, and after several minutes, Obama entered the room. “I had a pretty visceral reaction,” said Patrick Cirenza ’15, who also attended the meeting. The students, Obama and the White House officials spoke on a wide range of topics for approximately one hour. Obama began by addressing sexual assault on college campuses and expressed his support for cultural change on campuses and better awareness. They then talked about issues of cybersecurity and national security, followed by an open discussion on any topic the students wanted. Trey Deitch ’15, a computer science major who has had a long-time interest in network security, spoke with Obama about his view of cyberattacks. Other students spoke about issues other than cybersecurity. The United States’ responsibilities in Syria came up, as did the civilian-military divide. Some of the senior attendees even discussed their honors theses with the president. Many of the students in the roundtable commented on Obama’s personality. Vicki Niu ’18 said he was very down to earth and father-like. “I made a ‘Thanks Obama’ joke and he laughed at it, and I felt so validated,” she said. All of the roundtable students expressed gratitude and a sense of having learned a lot. LaVigne, who comes from a technical cryptology background, said she enjoyed experiencing the policy side of cybersecurity. 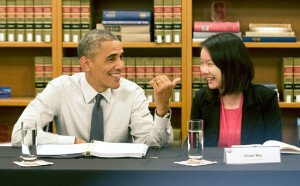 Niu appreciated hearing Obama’s and other policymakers’ insights on the decision-making process. Members of the student population who were able to attend the summit through the lottery or various student groups expressed similar ideas. Tristan Vanech contributed to this report.